Democrat Doug Jones has bested Republican Roy Moore in a nail-biter of an Election night in race to fill the U.S. Senate seat previously held by Attorney General Jeff Sessions. As of 9:38 p.m. CT Jones has 0.8 percentage points over Moore with 93 percent of precincts fully reporting. The Associated Press called the race in favor of Jones with 89 percent of precincts reporting. 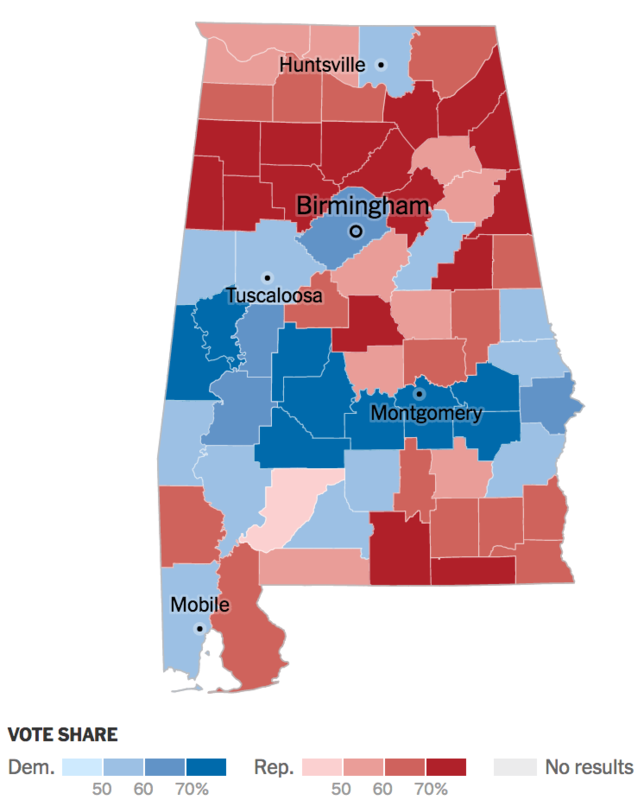 Alabama is a deeply conservative, red state. But Moore has found himself under fire since The Washington Post published an explosive report on Nov. 9 with the accounts of four women who claim he sexually pursued them when he was in his 30s and they were in their teens. Since that time, a total of nine women have levied accusations against Moore. While Moore has vehemently denied the allegations, his campaign has remained mired in controversy, creating an opening for a possible upset by Jones. Polls closed at 7 p.m. CT. Results as of 9:38 p.m. CT. Updated at 9:38 p.m. CT.